Training on the usage of CAT and Genny through practical exercises, showing the importance of properly locating underground services prior to excavation. This is a course for those involved in the Excavation and Re-instatement of the highway and are specified under the New Roads and Street Works Act (NRSWA) 1991. 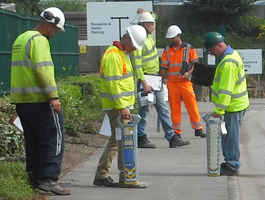 This unit is primarily aimed at operatives that are required to survey land prior to excavations, in order to locate underground services. This is a competence based training course that covers assessment of the use of equipment that is used to locate underground services, prior to excavation. Your knowledge will be testing with practical exercises, using the equipment.